For god's sake, more coverage of Brenda Nesselroad-Slaby? As if two weeks of unrelenting stories and video of her police interview and video of her dropping off doughnuts moments before Cecilia's death weren't enough, now we have exclusive photos of... the inside of her car. At least the print edition doesn't have the the same photo front and center, like it did recently with a vidcap from her police interview. Not to say I haven't read each and every one of those articles (I did not watch the videos!). 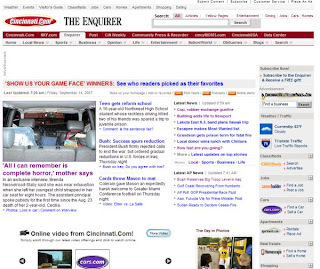 Because the Enquirer is right about one thing: the story provokes, I believe, some interesting opinions on topics ranging from equality in our justice system across race and class, to the frenetic lives many middle-to-upper class Americans are leading right now. In a society that is moving faster and faster, observe: a 40-yr-old mother with a 2-yr old and a 5-yr old, an assistant principal, earning $70-$80k/yr. Put another way, a career woman holding off children like many career women these days, doing well for herself compared to most women, her daughter's not-too-common name, and her own hyphenated surname. From her interview today, she had tried to do be everything to everybody, a super mom and a super administrator. Let me point out some other things. Admittedly, I am biased because I hear about some nightmares in education every day. Nesselroad-Slaby was at the bakery by 6:30 am, at work by 7 am for her 7:15 am school-openeing meeting that was to last 8 hours. The woman was up by 6 am at the latest. I know that there are millions of career mothers who have never left their children in their cars. But all it takes is one time. And how many of them consistently wake up before 6 am every morning? Some months ago, a poor, young, single African mother was arrested for locking her two children in the closet while she went to work. Her children were taken away. The children were fine save some bruises, hungry - I think they had pissed themselves or something. Apparently, she had done it many times before. This mother was single and poor. No father to watch the kids. No money for daycare or a babysitter. No father to earn extra money. Have to have a job. America is worst in the world when it comes to policies for working mothers. What was she supposed to do? Now she has a criminal record. Her young children will grow up in foster care for quite some time probably. Any chances her son/daughter will contribute to a single parent family himself/herself? The mother who accidentally forgot her 2-yr-old daughter in her car deserves no charges and no jail time. Honestly, I don't believe the poor, African mother deserved any either. In the single mother's case, of course she made a (bad) choice to leave her children at home, when she should have sought help from either friends or from government programs that are available. But if she didn't have any friends, and these programs are not ideal or she didn't even know about them, then it doesn't leave many options. I'm not sure what the solution would have been for her case, but locking her up and taking away her kids certainly does not get at the root causes. The african american mom had beaten the children severely and regularly. Neighbors heard children screaming and crying on a regular basis. The baby's skin was blistered and peeling from sitting in a acid based urine soaked diaper for several hours. Both children were under weight and malnourished. Both moms should go to jail. At lease one did. if that's true, and the african mom beat her children, then she should go to jail. If she cared well enough for them other than leaving them alone in a closet, I stand by my blog post. Baby's in dirty diapers for any extended amount of time will always end badly, but I wonder if it was like that when she was home as well.